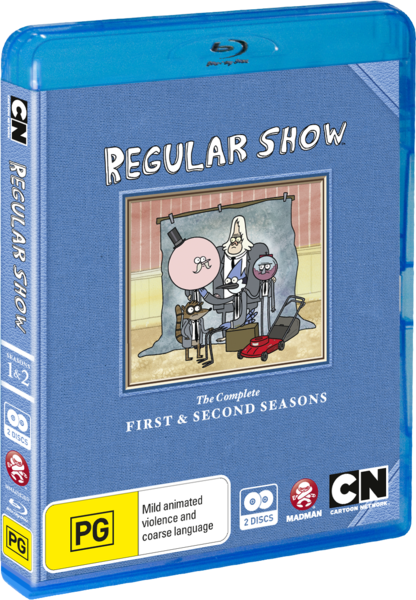 Regular Show - The Complete First and Second Seasons is a collection of the first forty episodes of a show called "Regular Show". 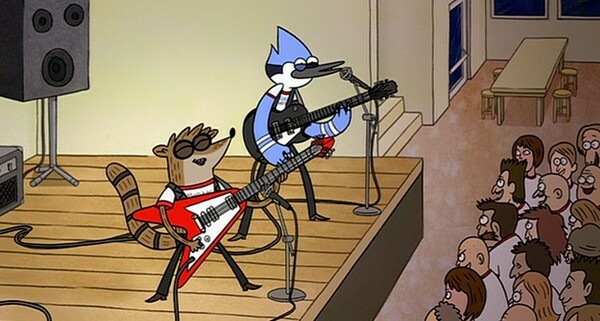 This show is about a tall blue Jaybird named Mordecai and a short brown Raccoon named Rigby who are both broke and decide to go look for a job to earn a living. They end up getting a job working at a park ran by a giant talking lollipop man named Pops. 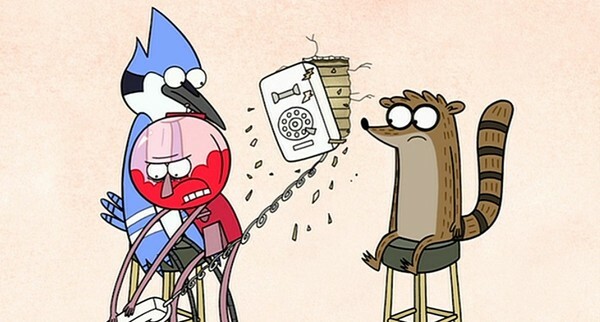 Mordecai and Rigby aren't exactly the best employees out there as they goof off all the time and their supervisor Benson (who is a living gumball machine) always gets mad at them and tells them off constantly. 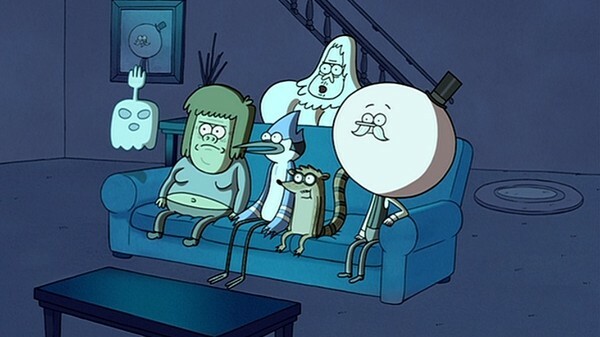 Mordecai and Rigby also find themselves in very bizarre situations like: Summoning flesh-eating zombies during a horror movie screening at a graveyard, defending the park from some very annoying unicorns, going around the park with a magical keyboard that makes Mordecai and Rigby corrupt with power, Mordecai and Rigby being followed around by a Beholder (just like the Beholder from Dungeons and Dragons), and Rigby getting sprayed by a wereskunk while scooping up roadkill. 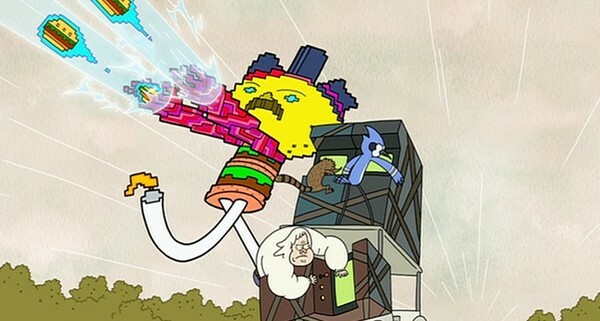 This show is anything but regular. (Click "Read More" to read the full review). The stories in this show are very episodic and they are also packaged very well where you have very filling yet basic stories that all have a start, a middle, and an ending. This is also one of those shows that's like a really tasty potato chip as you can't only have one and you'll find yourself watching episode after episode after episode until the disc ends... Then you hit "Play-All" once again and re-watch the episodes again and again and again and so on. The humor in this show is really funny and where the jokes can appeal children and you also get jokes that only the adults will get. Even though this is marked as an "Children's Show" the humor in this show can sometimes be a bit too adult for young children to watch and a parent should watch the show first before letting the younger ones watch it. One thing I'm really glad about with this release is that all the episodes are in their uncut and uncensored form which is good as I get to see all the stuff that was edited out of the television broadcast. Not only that but all the stuff they cut out for television was very awesome and funny footage which makes this show even more awesome that they kept all the episodes uncut. Well I sort of lied about all the episodes being uncut and uncensored as there is one episode ("Meat Your Maker") has one line censored. 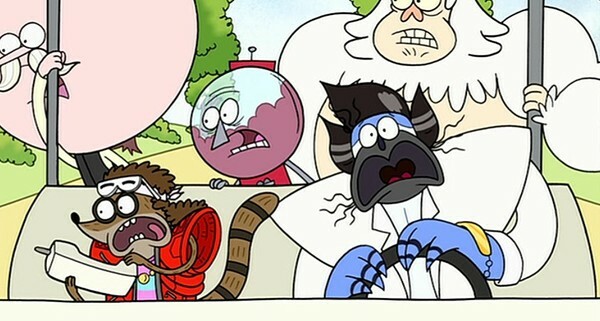 The line that they kept censored was in a scene where Mordecai gets mad at Rigby and says: "You just pissed me off" and kept the edited version "You just ticked me off" instead but other than that the rest of the episode is remained unedited. One of the few things I dislike about the show is all the references to the "Hipster Culture" and I am aware that is a very petty complaint but it's because I didn't find the jokes about them very funny but rather annoying instead. Another thing I dislike is that some of the scene transitions are very sudden and it looks bad like if someone edited a film by just using a camcorder and hitting "record" and "pause" to separate scenes. I really love the characters in this show as they are charming with some great personalities. I do like how they are inspired (or seems to be to be more accurate) by some of my other favorite characters like Ren and Stimpy (from Ren and Stimpy (1991 - 1995)) and Howard Moon and Vince Noir (from The Mighty Boosh (2004 - 2007)). Artwork in this show looks very basic and very charming as it captures that cartoon feeling really well. It is also has a very strong edgy 1990's look that helps add to it's charm and reminds me of shows like: Daria (1997 - 2002), Beavis and Butthead (1993 - 1997), Rocko's Modern Life (1993 - 1996), and Duckman (1994 - 1997). Animation is decent but there are some bits where it can look awkward. The voice acting in this show is very awesome with the voices matching all the characters perfectly. It is also a very memorable sounding dub that's bound to be in embedded into all your memories for years to come. The soundtrack to this show uses a mixture of original and licensed music. The original music sounds okay but it's a tad bit forgettable. One of my biggest fears with this set was that all the licensed music was going to be replaced as we have seen in the past when it comes to TV shows being released on DVD, take Married With Children (1987 - 1997),The Wonder Years (1988 - 1993) and even the anime Speed Grapher (2005) (I know that's an odd pick) for example. I was very happy to see that the licensed music was kept in as the music they picked ("Working for the Weekend by Loverboy" is one of them) helped add some charm to the scenes and replacing it would just make the scene feel less memorable and a bit weird. There's a very nice amount of special features in this set including commentary from the cast and crew on every episode which is full of great information. This set also includes the pilot episode which is really great. you have animatic versions of "The Pilot" and "The Power", pencil tests, computer animation tests, a behind the scenes documentary which was nice to see, another documentary called "JG pitches "The Power", a random karaoke video called "Sam Sings Mystery Karaoke", a music video for the song "Party Tonight" which is a song from the classic episode "Mordecai and the Rigbys", commercials and trailers from comic-con, and to top it all off we have a very nice animated short called "The Naive Man from Lolliland" which is about Pops adventure to an American restaurant. Overall this was a very funny show and while I can't recommend this for young children I do recommend all the adults to check it out. Great viewing.